Typing is easy to learn but it is not that easy to get a good speed. This post is for typing in any language be it English typing, Hindi typing or any other language. Basic rules are common everywhere. Good typing speed may have different measurement for everyone. Candidates preparing for government job typing typing test want to achieve the typing speed required by their government typing test, an employee want to save his time he takes to format letters, filling up online forms, data entry etc. In this post you will get an absolute idea to improve your typing speed in a short period. Regular typing, time management and good typing chapters any one can do this easily. So be confident and try to follow this article. When it comes to learning we human learn by repeating the things over and over, typing is not the exception. Practice is the key to improve typing speed. Mostly people suggest the thumb rule is practice, practice and practice. It is true but we at Soni Typing Tutor believe that it is not the complete story. Something is missing from it. That is repeat process. If we repeat the same thing over and over we can master that particular thing may be type, music, maths or anything. In Hindi typing and English typing first thing you do is repeat the same paragraph again and again. Type it as much as time you start to feel that your fingers have memorized almost all the words in the paragraph. Follow these two steps to improve typing speed quickly. Select typing matter:- Select a paragraph of 100 words maximum. Best choice would be to choose 50 words only. Soni Typing Tutor user can find this type of paragraphs easily. You can choose your own typing tests also. In Soni Typing Tutor (1) Select ‘Learn Typing’ option, may be in English typing section, Hindi typing section or Numeric typing section. New window will open. (2) Select ‘4. Type Paragraphs’ step at fourth position. Here you see 50 short paragraphs. Repeat, Repeat, Repeat:– Repeat the same paragraph again and again. Paragraph word limit should not be more than 100 words. Best choice is 50 words. This paragraph should be repeated without caring about your speed. You should note your typing speed before you start typing the chosen paragraph. Note your typing speed as you finish the typing at first time. Now repeat the same paragraph again and again for at least 10 time. Don’t be hopeless if you don’t see any improvement in typing speed every time. After 10 or more repeats you will definitely see the difference in your typing speed. Type, Type, Type:- Practice typing as much as you can. English typing is free with Soni Typing Tutor. No activation key is required while learning English typing.Hindi typing is a little bit harder than English typing. First reason is that Hindi typing has some special characters which can be typed by pressing a key combination. These key combinations are called Alt-Codes as Alt key is kept pressed while using these codes. So you must remember all or some of these Alt-Codes for faster speed. Second reason is that Hindi typing requires different finger position than English. If you have been practicing for months and still your typing speed is not improving as expected. 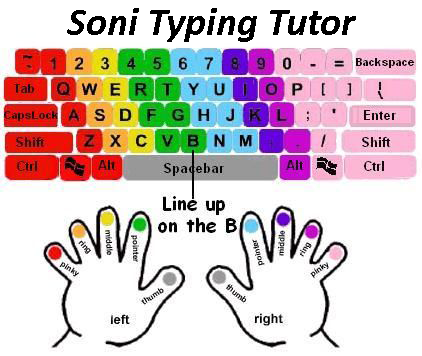 Soni Typing Tutor’s approach can help you increase speed quickly. Without practice and repeating the same chapter again and again no one can improve speed in a short time. Hope this article will help you. If your typing test is scheduled early and you have not enough time to practice then follow these three simple steps. You will definitely pass your typing test. Be confident and start typing. Do not waste your precious time for looking for online typing tests. Speed can not be built overnight. It takes time and efforts. Thanks for reading this article. If you have any questions, suggestions and thoughts please write us in the following comment box. what about hindi typing ?